The water sensor gives you early warning of water leaks in your home. Water damage is common in private flats and can be expensive to repair. Gigaset elements water reliably senses any danger due to leaking water, thereby helping avoid more severe damage. This smoke alarm device informs you immediately about smoke development in your home. The Gigaset elements smoke immediately sounds an alarm if the presence of smoke is detected. You are informed via the app in an instant. The integrated siren also triggers a loud alarm at your home. In addition, the Gigaset elements siren also sounds an alarm. The reasonable addition for your Gigaset elements alarm system for larger houses and apartments. The motion sensor enhances the Gigaset elements alarm system for any room. Human movement activates the infrared motion sensor. The suitable enhancement for your balcony - and terrace doors. Don’t let your doors go unguarded anymore! The enhancement to the Gigaset elements alarm system can tell immediately whether a door has been opened normally or whether a break-in attempt has been made. With this sensor no window remains unmonitored. Don't let your windows unattended. With this enhancement to your Gigaset elements alarm system, you’ll be the first to know what’s going on with your window, your terrace door or your balcony door. The window sensor reliably informs you whenever your window, terrace door or balcony door has been tilted or opened. This way you’ll always know whether everything is okay at home even when you are out and about. Windows and doors are among the most common places of entry for burglars. Protect your home! 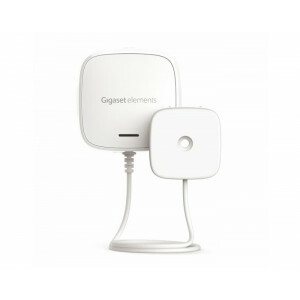 The Gigaset elements universal sensor secures the entrances and points of access to your flat or house. As soon as a door or window is opened, you will be informed via an app on your smartphone. The sensor alarm sounds in cases of forced entry.